This is all ezkilla2‘s fault. The other day he wrote a post about a cool project he’d started — the ShacknewsCommentsFilter. I’ve been dying for something like this for ages, and thought about writing a Greasemonkey script to do it myself, but ezkilla2 beat me to it, and I thank him. You can also now filter posts by author. Tired of another shacker constantly shitting up latestchatty with their emo crap? Filter them out — it’s pretty sweet. Tired of shackpolls and emo posts? 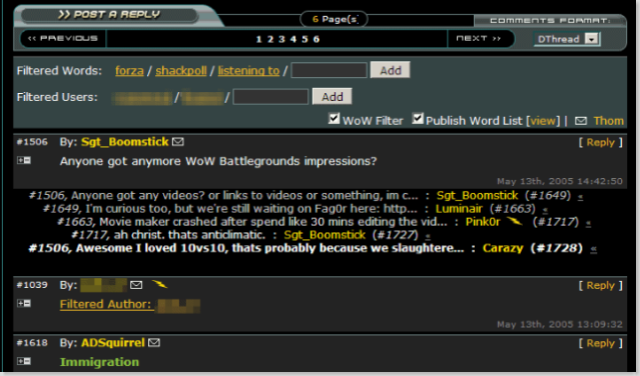 Add ‘shackpoll’ and ‘emo’ to your filtered words list! Been bitten by ShackHype one time too many only to find out that everyone who was foaming over a game yesterday traded it in for this week’s BESTEST GAME EVAR? (I’m looking at your Black & White!) Filter it out. To add a word to the filter list, enter the word in the text box in the Filterd Words bar, and click ‘Add’. You can also add filters for partial words. Let’s say you’re tired of hearing about DoofBlaster the awesome new game that’s taking the Shack by storm. You can nuke the posts containing references to the game by adding ‘doof*’ to your filtered word list and it’ll kill any post with a word starting with “doof”. To remove a word from the filter list, click the word in the Filtered Words bar. You’ll have to manually refresh the page to see the results. Authors work the same way. Just type the name and click “Add” to add them, and click on the name to remove the name from the list. 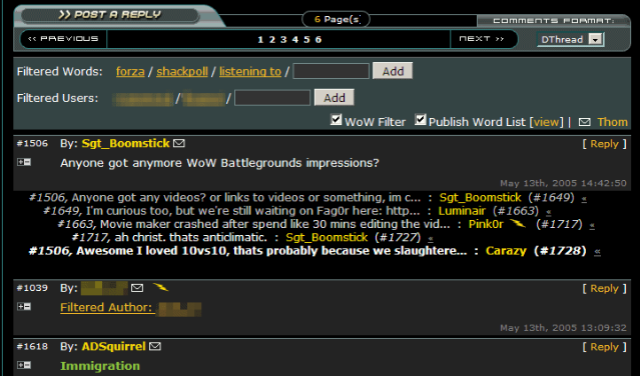 Another neat feature of the comments filter is the ability to share your filtered word list with everyone. If you turn the publishing on, your word list will be transmitted to my site here where all the scripts’ users filtered words are shown in a Top 10-style list. People can’t tell which words are yours specifically, but it’s neat to see what everyone is filtering. Graciously allowed me to use some really neat XPath code from his Shack collapse thread Greasemonkey script. This entry was posted on Tuesday, October 24th, 2006 at 12:00 am	and is filed under Greasemonkey, Shacknews. You can follow any responses to this entry through the RSS 2.0 feed. Both comments and pings are currently closed. Thanks, this blog aided me in solving some problems with the latest version, Why do they often seem to leave out vital documentation when they release a new version? It may be trivial to them but not for us! I’m sure i’m not alone.